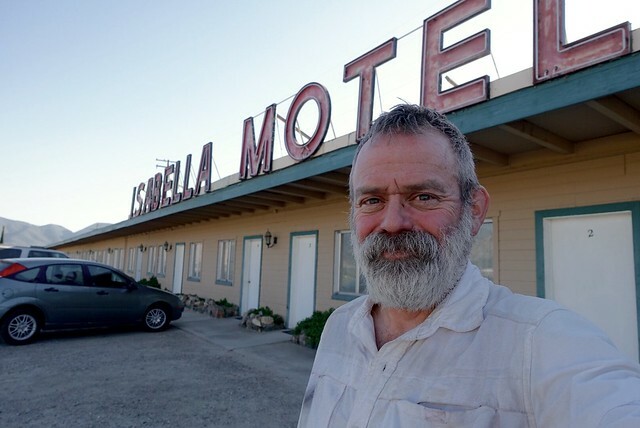 A pleasant mostly shady walk, with a motel at the end of the day. After yesterday, I was determined not to have a bad day. This is my trip, I can enjoy it or not, it's all up to me. 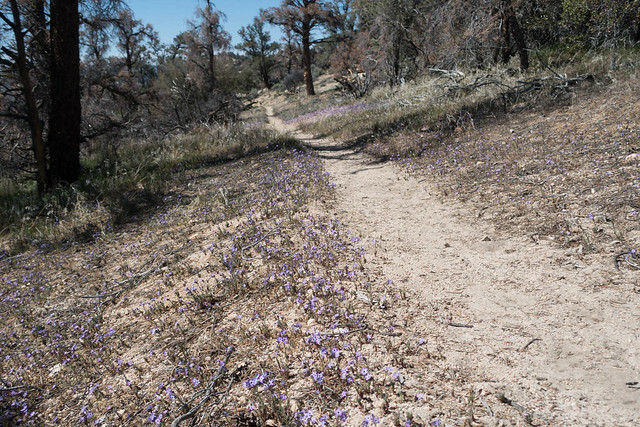 And I did--I walked on a warm sunny windless day through wildflowers all along the trail, really enjoyed the expansive views, and even helped clean up the trail. I just zoomed up that 2000 foot climb to the top of the ridge--it was shady for almost the entire ascent, shaded by the bulk of the mountain, and at the top the PCT flattened out with great views off to the east towards China Lake and south to Red Rock. 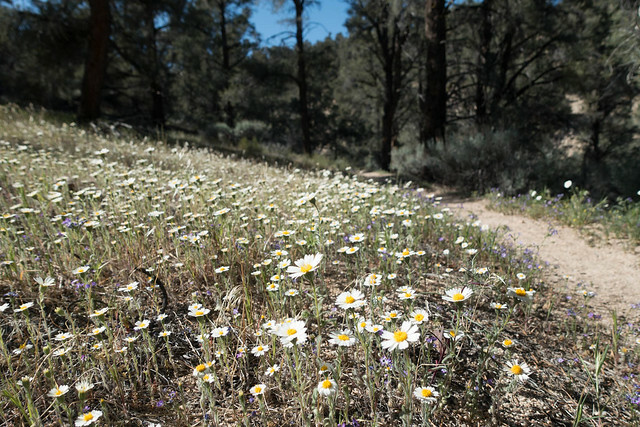 These south facing slopes had great carpets of the daisy I call "eight petaled daisy", bright yellow and more flower than anything else, it looks like someone stuck plucked daisies in the ground with a little sprig of ferny leaf as garnish. 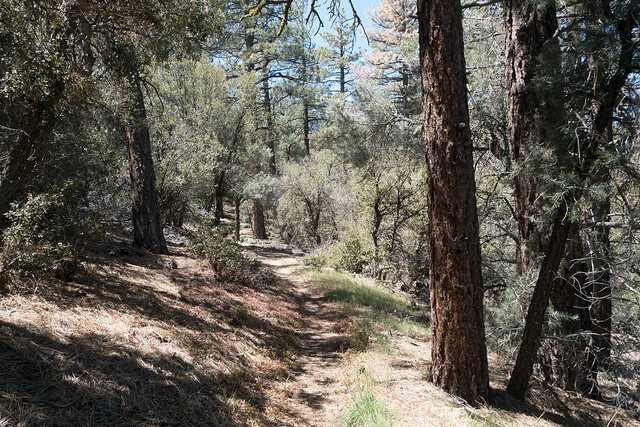 The hike along the top was pleasant, again under the half-shade of pinyon pine and golden oak, with green grass underneath. Around mile 637, the cutoff for Yellow Jacket Spring, I heard a gaggle of dirt bikes fart on by, just a couple of hundred feet east. Damn, it's Saturday, time for everyone to recreate in the forest. The PCT paralleled a road for quite awhile, so while it was pleasant it wasn't quite peaceful. 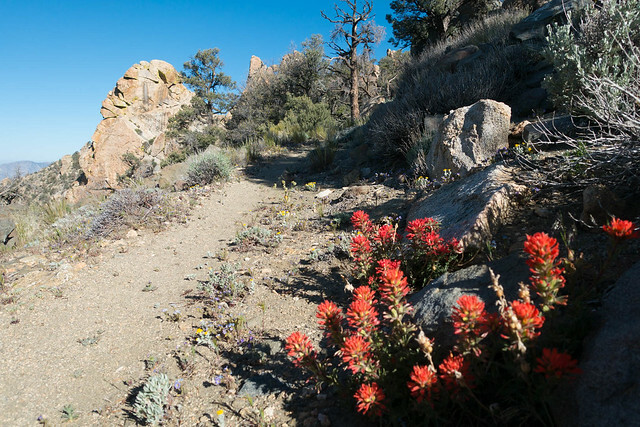 After a few miles, the PCT did end up joining the road, which meant another dusty road walk. I ended up in the middle of a jeep convoy, and when the jeep in front of me suddenly stopped I said "Hi!" and they asked if I wanted water. I thanked them, but I already had 3 liters which is more than enough to get me the 12-ish miles to the road. The jeep convoy was an organized outing from a Ridgecrest 4x4 club--they were being awesome and picking up trash along the road. I said "Hey, I'll put any I see on the side of the road!" and I found a fair bit--maybe half a dozen beer cans, a brake handle, those little whippet air canisters, a crushed box of wet wipes, an old coffee can that was a huge size I haven't seen since my grade school science project days. It was a fun little game, and relieved the monotony of a dirt road walk, with its humps and jumps, grit and gravel. 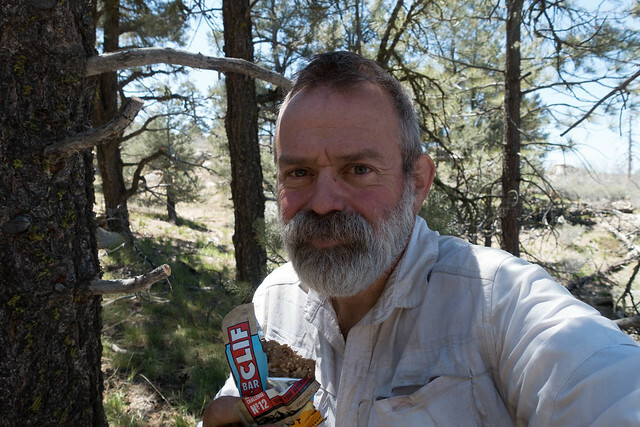 As the PCT approached McIvers Spring, I considered going over, it was at most a five minute detour some 400 yards east, but the pop-pop-pop-pop-pop shots from a semi- automatic firearm richoceting off the boulders above the spring was a big turnoff. There must have been a hundred rounds fired, it went on for a good twenty or thirty minutes. Saturday amateur shooting, I did not want to be a target. Instead I found a nice sitting rock around mile 645 and took a twenty minute break, mostly out of earshot and definitely out of sight from whomever was out there. 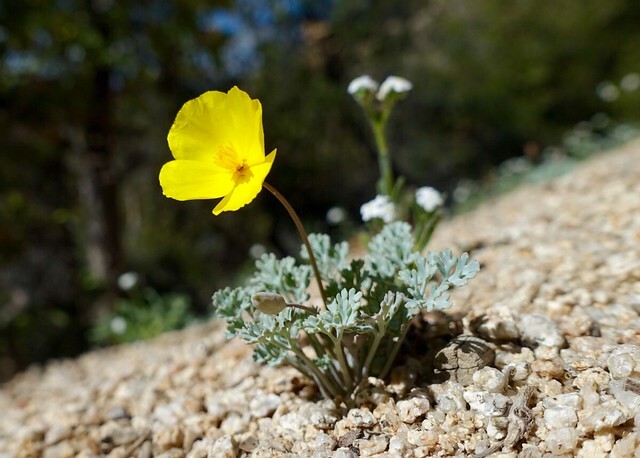 The PCT crested around mile 646, then went down down down, and this was a great walk. 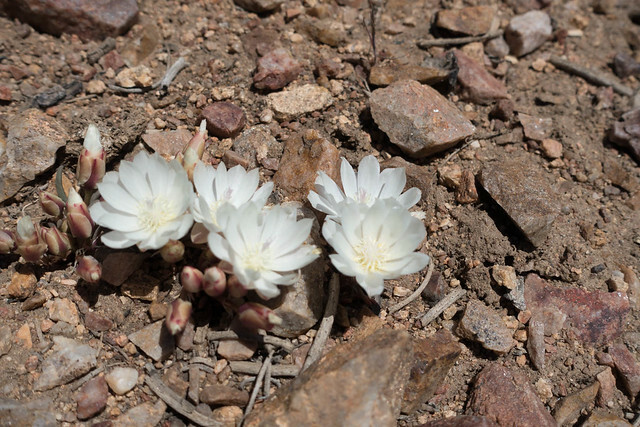 My pack was light--almost no food or water--and the wildflowers were abundant. Every mile seemed to have a different variety, one mile was purple, the next pink, then white, then yellow. The painted lady butterfly parade continued, along with more than a few sphinx moths on the pink flowers. Those moths were really interested in my white shirt; I wonder what ultraviolet dyes were put in the Tide detergent when I last did laundry to make it so attractive. 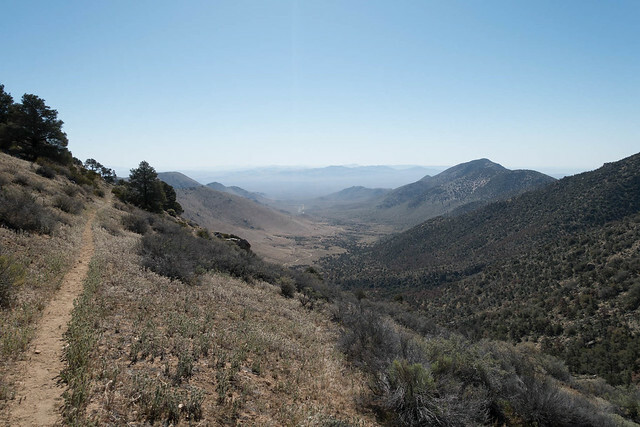 There were views out to the north, way out past Olancha Peak, and I got a better view of the high country around Cottonwood Lakes and beyond, with very little snow on the south facing slopes. 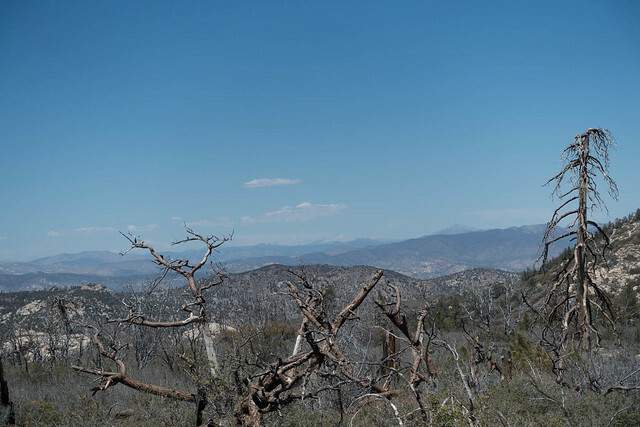 Up closer, the forest was denser, and a bit more unhealthy, with maybe a quarter to a third of the pinyon trees dead and brown. Drought? Bark beetle? Both? I wondered what the forest would look like in a decade if this kept up. 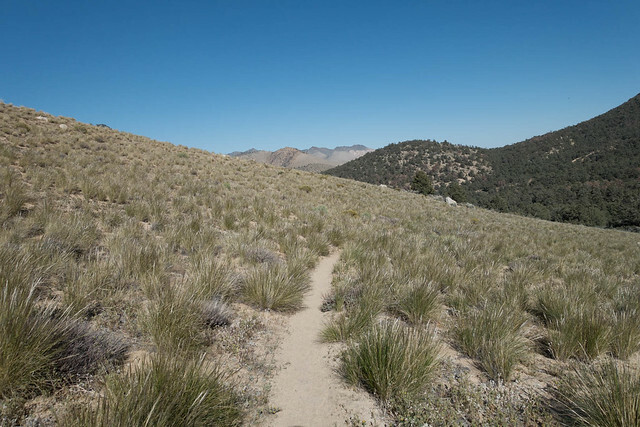 Near the bottom, the trail went through a very unusual area--a grassland entirely of native bunchgrass. There's almost no place that looks like this anymore, but it's what California looked like 200 years ago before the Spanish came to this country and colonized with their livestock and European grasses. 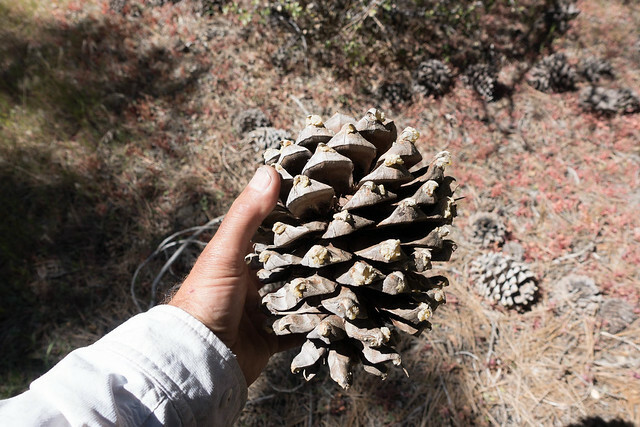 Those tawny golden grassy hills of mid-summer California are imported; what's authentic is the gray-green tall bunches of grass that the PCT walked through for half a mile. It was special, a little secret landscape you could easily overlook. Then it was motel time; I checked into the Isabella Motel, showered, and walked over to the excellent Cafe Sarape for a michealada and a tasty seafood enchilada. Muy bueno... and I walked back to the motel and crashed in the warm comfy bed. Tomorrow is a resupply and rest day. The shin is doing fine, it feels slightly swollen and a touch sore but isn't bruised, even after hiking 43 miles in two days with a moderately heavy pack. I want to see about getting some foam for under my regular sleeping mat for those 20 degree nights, do some laundry, upload some pictures, relax, and go to bed early. There's a public bus that leaves for the trailhead at 5:15am, and I intend to be on it.